Bill Gates, the chairman of Microsoft and co-chair of the Bill & Melinda Gates Foundation praised UCF’s online learning initiatives during an interview with reporters. Below is an excerpt from an article published by PC Magazine. The full article can be viewed on the PC Magazine website. 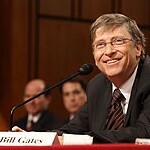 The Bill and Melinda Gates Foundation on Monday announced a $20 million grant program to improve college graduation rates via technology, which will probably be oriented around online education and learning programs. The initiative, first disclosed last week, will be known as the Next-Generation Learning Challenges, a $20 million “funding round” of grants that will be handed out in grants ranging from $250,000 to $750,000. “Education is the biggest priority for our foundation here in the United States,” Bill Gates said in a conference call Monday afternoon. “We think it’s the most important thing for the future of the country,” he said. Gates said that the goal was to develop more effective methods for education, and that the primary means was by tapping into the most effective educators and sharing that knowledge with others. The most effective way, he said, was through online education, where “it was pretty clear,” Gates said, that pairing world-class lecturers with the ability for a student to move at his or own pace, acceessing the material online at any time, any place, would be the most effective. The Gates foundation has put together a team, working with Carnegie Mellon, to try and identify these new opportunities, Gates said. He identified the Khan Academy and the University of Central Florida as two leaders in bringing education to a broader audience via the use of online videos. But making a course interactive takes a lot of extra effort, he said. Gates said he envisioned a future where a very motivated student could complete nearly all of her coursework online, while another might require a blend of face-to-face and online interaction.